Lindsay Lohan's estranged parents settled their long-simmering divorce and custody dispute Friday, winning praise from the judge who presided over their case. "You have both demonstrated to me extraordinarily good judgment in resolving this matter as you did," state Supreme Court Justice Robert A. Ross told Michael and Dina Lohan. Terms of the divorce agreement, which will become official within 60 days, weren't disclosed. Dina Lohan has custody of the couple's two minor children, Aliana, 13, and Dakota, 10. 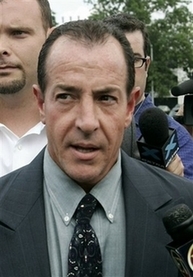 Outside the courthouse, Michael Lohan said he was looking forward to seeing the children again, though it wasn't disclosed when or under what circumstances he might do so. Neither Lindsay, 21, nor her brother Michael, 19, were involved in the divorce proceedings since they are no longer minors. "I wish Dina the best and I hope we can both move forward and put our best foot forward for the kids' sake and just be good parents," Lohan told reporters outside the courthouse. Dina Lohan said, "Now the healing process can begin for my children and myself." She said Lindsay, who was arrested last month in Santa Monica, Calif., on suspicion of driving under the influence and cocaine possession, is doing "fantastic." The "Mean Girls" star faces an Aug. 24 court date in connection with that arrest. Lindsay has been the subject of intense speculation since her arrest, which came just two weeks after she was released from her second stint in rehab this year. Various reports have placed her in a rehab facility in Utah, but no one is talking on the record. The Lohans were close to an agreement on a divorce settlement in 2005, but that deal collapsed while Michael was serving a prison term for drunken driving, brawling and other charges. He was released in March and entered a Christian-based drug and rehabilitation center in West Babylon. He has repeatedly said Lindsay needs the same kind of treatment.